This year fashion has been all about boho-chic and ’70s inspired alluring pieces that major fashion designers and high-street giants don’t stop illustrating in their new collections, daring us to update our closets with a fresh new style. Seems like almost everything is clear about what clothes you should wear this season, though there might be a little help needed in terms of accessory choices. We decided to give you a pretty good idea on how to give your mom’s old items a chance to prove not at all boring and even quite trendy! And, of course, you can do this with the help of some cool fashion accessory, a bag, for instance, or a stylish tiny belt bag to be more precise! You probably know that the must-have accessory for keeping your necessary belongings is the saddlebag this season, which undoubtedly is pretty handy and looks cool. But what if you could get your hands on a more convenient alternative, which is stylish, practical and leaves your hands free to do anything you want? Interested? Yes, there is an old and well-known fashion item that you can now combine with almost anything you wear: it is the fanny pack or belt bag! 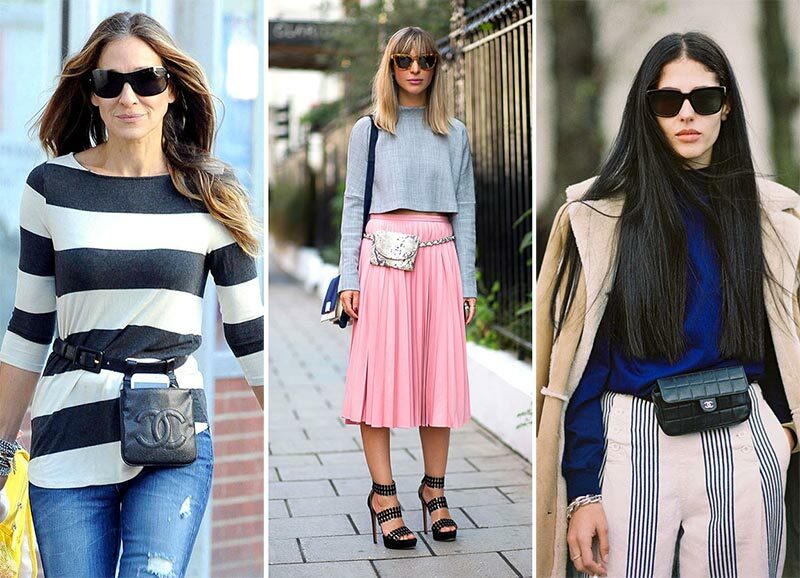 During the latest seasons we have seen many a blogger and celebrity wear belt bags as a winning finishing touch to their outfits and they all looked fabulous. You want some proving evidence? 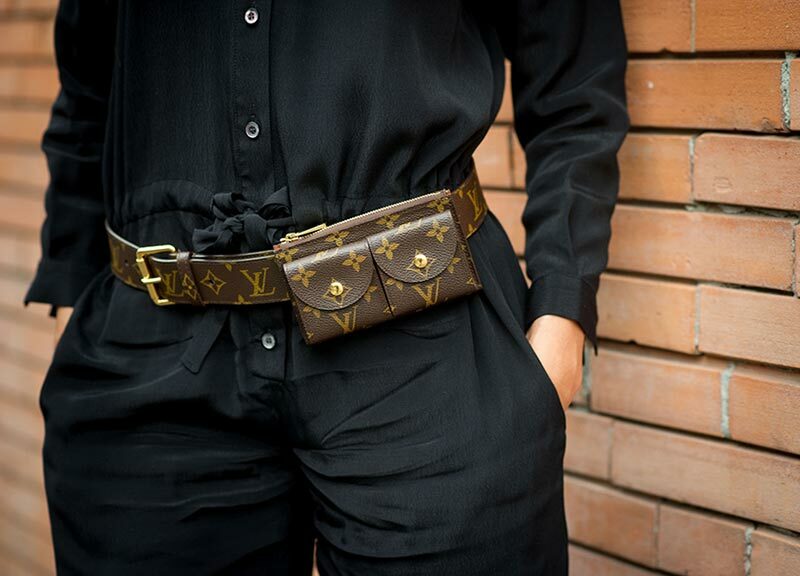 All right, here it is: Style Heroine’s Evangelie Smyrniotaki was recently spotted wearing a dark brown belt bag from Louis Vuitton, which as she said, was so convenient and stylish, besides skillfully spiced up her total black outfit. Rihanna turned up in front of paparazzi cameras in a Chanel tweed ensemble styled with a belt bag and sneakers of the same texture and color, while Kylie Jenner was captured rocking a crop top with denim shorts that had a black belt bag on them. Quite a good reason to think of getting one for your stand-out looks, isn’t it? Sarah Jessica Parker, Nicole Richie and Kerry Pieri are other It girls that seem to be in love with the belt bag trend, wearing this tiny accessory with a myriad of outfits. Now let us talk about what to wear with a belt bag. It is summer and any cross-body bag or saddle bag looks cool with your favorite denim shorts, pants, lightweight dresses and so does a fanny pack! Just switch on your creativity, or borrow ideas from celebs: they have a whole bunch of style ideas for you now. 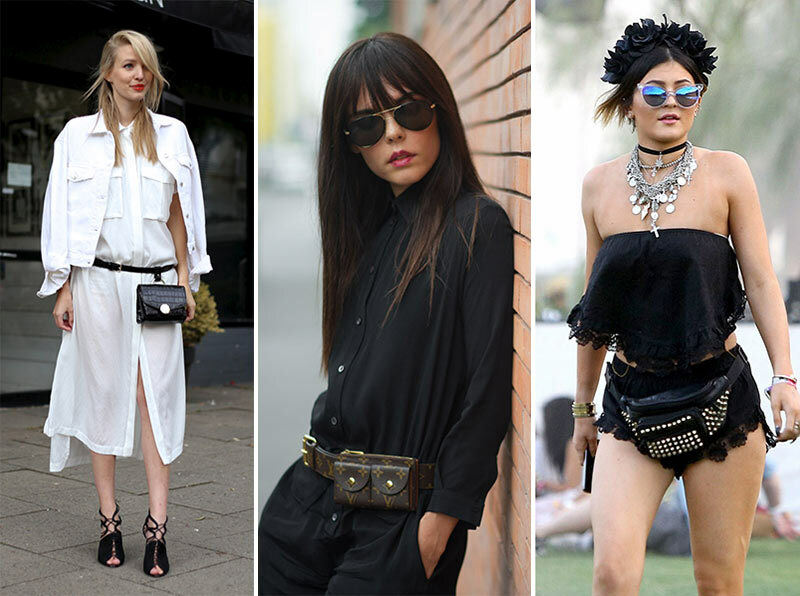 A belt bag is quite a versatile accessory making a stylish pair with practically any outfit, be that composed of a flirty mini skirt, a pair of ripped boyfriend jeans or elegant tailored shorts. You will only need to think on the color and style of the pieces you match with your belt bag and voila! You are a style icon of the street. But what is more exciting, you can wear belt bags during the fall season as well matching it with classic tweed pants, trenches, fluffy coats, leather jackets or strict blazers for an absolutely winning style mix. Besides this, belt bags look great with bell dresses, shirt-overalls and jumpsuits killing two birds with one stone! • A studded fanny pack to rock on festivals: You need a random monochrome (better black) fanny pack, some studs that you can find in any textile shop nearby or on ebay in tons of shades and sizes, and a flat-edge screwdriver. Keep the pattern in your mind and take the studs one by one, push them into the fabric of the bag so that the sharp edges come out of the other side (inside) and then use the screwdriver and push the ends of the studs down to secure them in the place. Once you are done with all of the studs, put the bag on and go to rock the party! • A watermelon fanny pack: You will need a fanny pack, pink fabric, green ribbon, fabric glue, black paint or marker and scissors. Cut a rectangular shape from your pink fabric in the best size and shape to match your fanny pack’s front part. Use fabric glue to stick that onto your bag. Measure your green ribbon, cut three parts to glue them onto the three sides of the pink fabric leaving the upper one open. Then take your black paint or marker and draw little random dots on the pink fabric. Your watermelon belt bag is ready to fit your fun and youthful outfits of sunny summertime! • Embroidered belt bag to make you the trendiest fashionista of the season: You will need a monochrome belt bag (black, mahogany or beer-brown) and three trims ” thread-fringe, feathery trim for the base and an embroidered trim which need to be the size of your bag’s front zipper. Do not forget about the glue. Take the fringe first and stick it right below the zipper up on the front. Make sure it still opens and closes (you do not want to have a useless bag afterwards). Then take the feathery trim and glue it right on top of the fringe trim base. Then stick the embroidered trim on top of the feather and let everything dry a little bit. Make sure that your trims differ in width: start with the wider fringe and then go narrow in turn. Once the glue completely dries, your extremely trendy vyshyvanka inspired belt bag is there to embellish your outfits making even the simplest of them pop out and shine.